David: Henry, it’s great to speak with you to learn more about your work in global health, particularly with the Global Health Residency Scholars Program. Let’s begin with what inspired you to enter the field of global health. How did you get into this business? Henry: I was interested in infectious diseases, trained in this field, did my Internal Medicine residency and Infectious Diseases fellowship at Emory, and was subsequently hired onto the faculty. In February 1992, I was also appointed to be the hospital epidemiologist at Grady Hospital in Atlanta. During my first month on the job, it became apparent that there was a large outbreak of tuberculosis (TB) occurring in the hospital, and transmission of TB impacted both healthcare workers and patients. This outbreak consumed all of my time. It was in the news. We investigated the outbreak and implemented control measures to terminate the outbreak and to prevent further TB transmission. Through this, I became fascinated with TB. There were many outbreaks in hospitals throughout the United States at this time, due to the upswing of the HIV/AIDS epidemic and lack of effective TB infection control measures. I entered global health because the vast majority of cases of TB occur in low- and middle-income countries, in the developing world. David: Who in your life awakened a sense of compassion in you, and how were the seeds of compassion nurtured? Henry: One reason people go into medicine is that they want to help others. However, our medical schools take very idealistic medical students and through all the training seem to grind the idealism out of them. During training, students and physicians in residency become desensitized and unfortunately often lose their compassion. I was fortunate to have very compassionate people as role models when I was going through training. 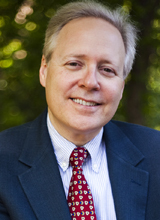 Jack Shulman, former Division Director of Infectious Disease, was Chief of Medicine at what is now called Emory University Hospital Midtown (formerly named Crawford Long Hospital). I had the good fortune of working with him for a year when I was Chief Resident, and then also when I was an infectious disease fellow. Even though we were extremely busy, he would always find time to get to know each patient as a person rather than just making a diagnosis and a plan. He would convey to the patient, “You’re important. I want to get to know you as a person; you’re more than just a disease.” People like Jack encouraged me to step back and remember that this is why I entered medicine to begin with. I still do some patient care. This keeps me grounded and in touch with the real world. It helps me generate different ideas to pursue in the clinical research realm, and helps me realize our limitations regarding what we don’t understand very well. I think patient care helps me be a better clinical researcher. David: Jack is a great example of a compassionate role model in clinical practice. What about the role of compassion in the big, more amorphous world of global health? Henry: Compassion is very important in global health. It’s why people get involved in the first place. 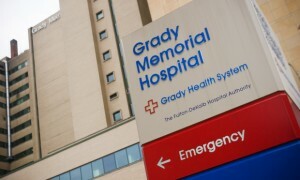 My work at Grady Hospital prepared me for global health because at Grady we care for people who have nowhere else to go. I was doing “global health” right here in the US. The world is much more connected now than it was when I was growing up, and with travel, people are exposed to the overwhelming needs of the world. For the past six years I’ve been working in Ethiopia. Sometimes that work can be overwhelming because there are so many needs. But I feel I can contribute. I realize that I’m not going to solve all the problems by myself. I’ve learned to focus. I work with a team and provide help where I’m able so as not to get overwhelmed by all the problems that we encounter. This helps me maintain my compassion, focus, and not burn out. David: You’ve been with the Global Health Residency Scholars Program (GHRSP) for several years now. 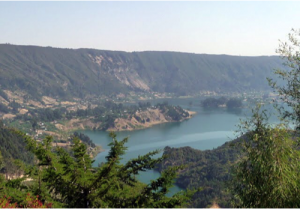 Henry: We’ve had three cohorts – 15 to 20 resident and fellow scholars per year in each cohort – travel to Ethiopia during the past three years along with a faculty member physician in their department. The rotations are one month at Black Lion Hospital, the major teaching hospital for Addis Ababa University. The scholars then attend a series of monthly seminars in Atlanta. We wanted to create a program that was beneficial for our colleagues in Ethiopia. We didn’t want this to be medical tourism. Part of the program includes didactic training in Atlanta through a monthly seminar series, so we work out in advance what lectures to provide to our residents. 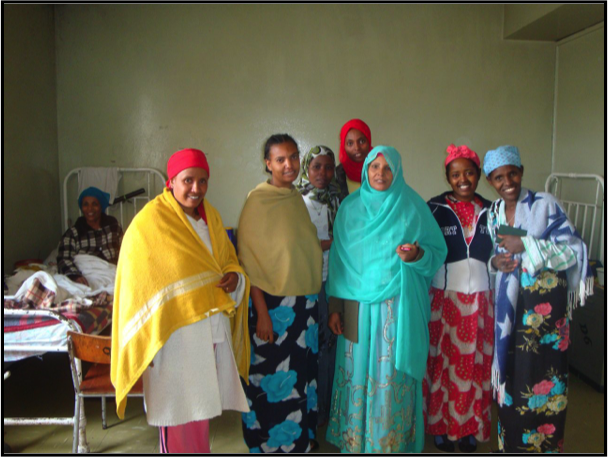 Another part of the program is rounding with the residents in Ethiopia. 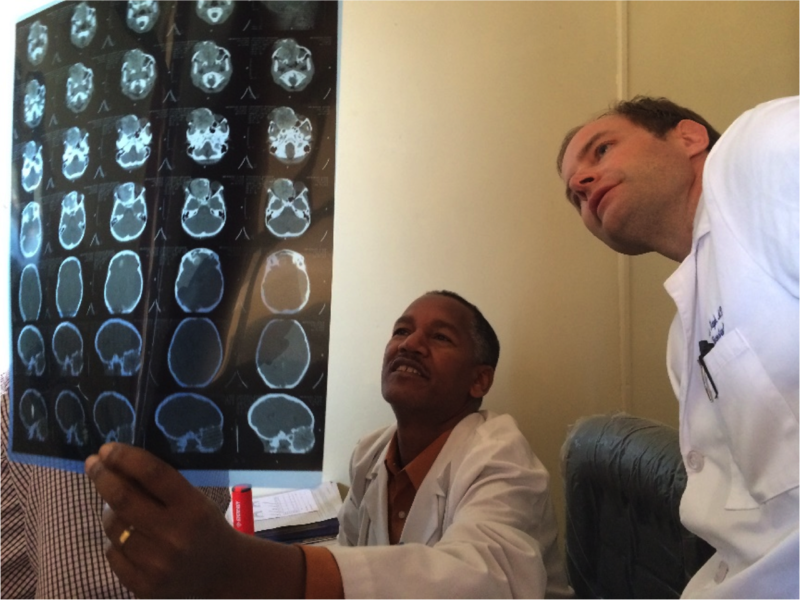 An Emory faculty member rounds with the Emory resident or fellow along with residents at Black Lion Hospital, which is the major Addis Ababa University (AAU) teaching hospital. GHRSP also provide mini-educational grants to the Emory residents to develop educational interventions or programs that they implement in Ethiopia in collaboration with colleagues at AAU. That’s worked out really well, and different departments and divisions have done different things. The Emory radiologists started it by creating an in vitro model to train AAU radiology residents to perform ultrasound-guided liver biopsies. The Emory team purchased things like calf livers and olives in Addis Ababa. They stuck the olives in a liver to simulate lesions. They took a glove, filled it with water, and put it in a liver to simulate a cyst. 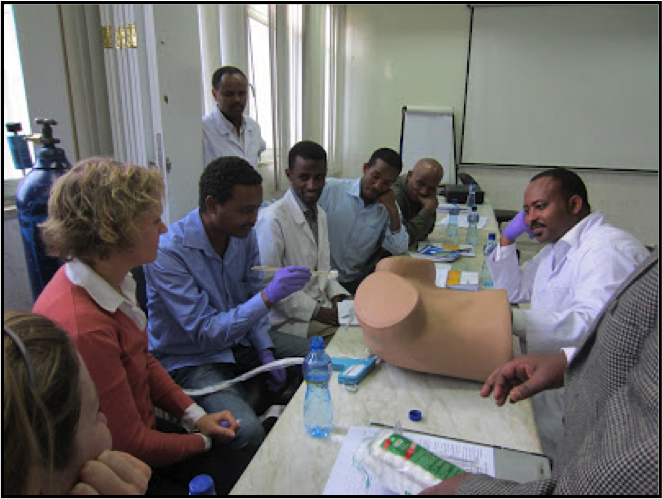 They then used these models to teach ultrasound-guided biopsies, to provide hands-on experiences for the Ethiopian residents at AAU. It was really creative. 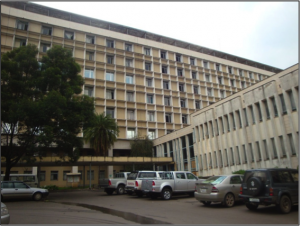 In another example, the Emory endocrinologists worked with their colleagues at Addis Ababa University to create treatment guidelines for diabetes. It sounds really simple, but until then there weren’t any patient guidelines. They made cards, laminated them, and passed them out to the patients. These projects can be implemented during the time the Emory senior residents and faculty are in Ethiopia, and the benefits continue after the residents come home. David: How has the program influenced the development of compassion or the expression of compassion among the residents and faculty? 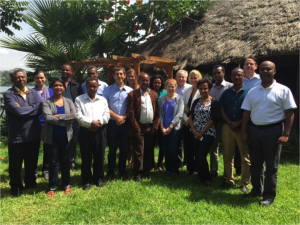 Henry: Emory residents and fellows return from Ethiopia saying, “This is the best thing I’ve done in my residency.” So now we are asking ourselves, do the residents actually become more compassionate through their global health work? Does this compassion wear out after a few months or is it long-lasting? 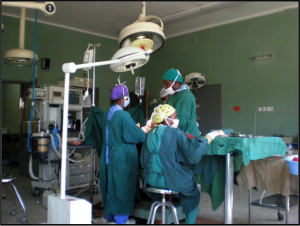 Those who are part of the GHRSP encounter a challenged health care system in Ethiopia and witness enormous need. I believe there are now scales that can measure compassion, so we might be able to evaluate the impact of the program. It’s a qualitative evaluation, but there may be a quantitative piece as well. It would be great if we could show that the program helps the residents and faculty become more compassionate, and impacts the way they deliver care in the US. That’s our hypothesis, and I’m hoping that you and others can help us either prove or disprove it. GHRSP is working at the edges, doing small things, but small things that are hopefully helpful. Our initial intent was to travel to Ethiopia to help them out, but we end up getting more out of it, so hopefully the program is beneficial on both ends. David: It sound like this opportunity provides the space and the situation for the residents to look more deeply within themselves. Henry: It really does. The Emory residents who spend a month in Ethiopia come back different; they’re not the same person. Most of them feel they’re a better person. The program has exceeded our expectations. David: When have you personally experienced compassion in the field – at Grady Hospital or in Ethiopia? Henry: Our collaboration between Emory and Ethiopia is with Black Lion Hospital. Ethiopians often seek help first at their local health center and work their way up through the health system to get to the hospital. They can subsequently be referred to Black Lion Hospital, which is the tertiary care referral hospital in Ethiopia. This referral process can be challenging. For example, one mother of a child kept coming back but was unable to get what she needed for her child. Our project coordinator who was working in Ethiopia (an Ethiopian-American who understood both cultures) engaged with the mom and stuck with her, trying to figure out how to help her. She got the attention of her boss, a pediatric surgeon, who was able to help the mother get to where she needed to be within the system. I thought our coordinator’s action was compassionate. Also, when traveling with colleagues very intensively for a week or more in the field, I learn more about them and their compassion in this different setting. For example, I was in Ethiopia once with the Chair of OB/GYN from Emory, Ira Horowitz. He traveled to Ethiopia to train the OB/GYN faculty to become GYN oncologists, training the trainers who were going to be in charge of the program. I saw his compassion at work in the way he handled a very challenging case, and without the tools he would have here in Atlanta at Emory, worked very closely with his Ethiopian colleagues to successfully complete the surgery. David: What are the specific challenges you’ve faced in your work? Henry: Sometimes it’s easy to get overwhelmed and think, is this hopeless? There are so many problems – can I really make a difference? But I find that if I take a narrow focus and have a few attainable goals, I am able to see a way forward, to see that some progress is being made. Also, I don’t do this work in a vacuum. I’m collaborating with people. It’s important to develop trust on both sides, trust with your collaborators. 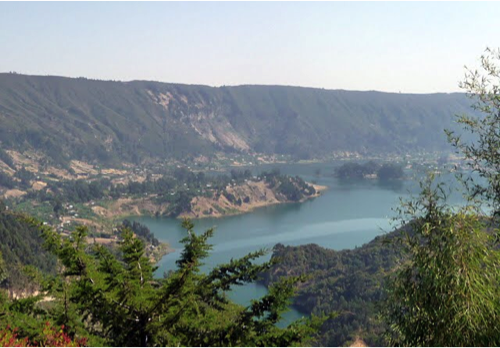 The two primary international places I’ve worked are Ethiopia and the country of Georgia. I’ve enjoyed working in both places. Sometimes the relationships can be fragile and may depend on certain people. There can be a lot of turnover in leadership, and a lot of politics. If somebody drops out and another person joins in who may not have the same interest in collaboration, it can become challenging. Collaboration takes time. Also, you need some degree of financial support to keep going. You can’t be totally 100% volunteer; it’s just not feasible. It’s possible to get certain people to donate some time and effort, but we need resources to fly people to the country and things like that. David: In addressing all these challenges, what is it that keeps you going and sustains you? Henry: Over a period of time I can see progress being made, and I feel a sense of accomplishment. I’ve been working in the country of Georgia for over ten years, and some of the people we’ve trained are now taking leadership roles. It’s very satisfying to see these people rise up and take leadership roles at their institutions and in their home countries and do well and establish successful careers. Also, global health is fun, and the people we deal with are extremely appreciative. It makes me feel good when people thank us for what we do. If I give a lecture in Ethiopia or Georgia, people are very appreciative. Maybe that’s a little bit selfish, but my colleagues and I enjoy receiving positive feedback. [CTSA] Award). In addition to clinical and translational research training, his research interests are focused on tuberculosis, healthcare and molecular epidemiology, and global health.